Click Here to find out how to receive 2 for 1 on all bottles purchased and for important information when using the online shopping cart to order H2ORMUS. No clinical studies have been completed using H2ORMUS� for cellular hydration. However, anecdotal feedback reveals that people experience wonderful and powerful health results from using H2ORMUS� in a similar manner as Core Water�, taking it in small amounts a few times a day. 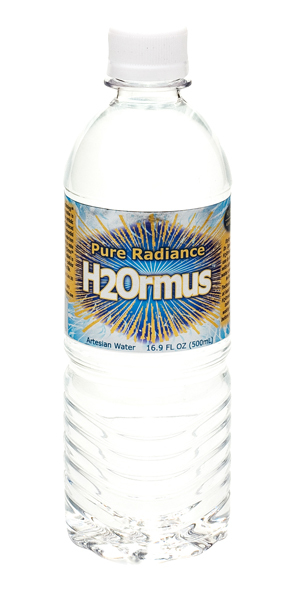 H2ORMUS� is a micro-structured water that contains much higher levels of stored energy and more available oxygen. In addition, what makes H2ORMUS� unique in comparison to Core Water is its capacity to super energize minerals in drinking water as well as the minerals already present in the body. Some experts refer to these super energized minerals s ORMUS material. Health Breakthroughs Internation patented M-Power Aqua Technology� is utilized to transform ultra purified water using the revolutionary Elix� system from Millipore� with the addition of small amounts of minerals from ancient clay sources. NMR O17 spectroscopic analysis was consistent with all other studies of water activated with the M-Power Aqua Technology�. A mineral analysis of H2ORMUS� revealed that the mineral content appeared to be 25% less in water activated with this special application of our patented technology. However, what this analysis was able to prove is not the removal of minerals but instead that they are transformed to a higher energy state that makes them undetectable with standard electrical analysis of mineral content. For a wonderful and refreshing taste, drink as is or for a more careful applied use of H2ORMUS� over a long period of time, take one capful right before going to sleep and right after waking up. By doing so there is no need to take undiluted M-Water� in the same way and only use M-Water� as an additive to clean drinking water.